Of course, it is Christmas—the season of miracles. I got this one as an audio from my library. The format is called "Walkaway" and it is a pager-sized unit that operates with one AAA battery. I don't have do download anything, worry about DRM or change CDs. I'm not a huge fan of audio books but I've been driving a lot lately and I prefer them to listening to the radio. 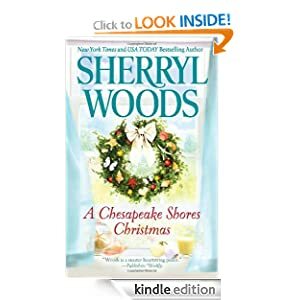 I've read an enjoyed many of Sherryl Woods' books including other ones in this series. This one kind of fell flat because I just never warmed up to Megan. After having five kids Megan decided her husband wasn't paying enough attention to her and the kids. Despite the fact that she still loved him, despite the fact that she had five kids, including some young ones, she decides to move to New York and start a new life. She had planned to take the kids with her but they balked (go figure). Now it's Christmas, twelve years later. Mick and Megan are still in love, Megan has made peace with most of the kids and Mick wants a New Year's wedding. Now, Megan wants everything her way. Sorry, I understand that some marriages may be intolerable but a parent who has other options does not move hundreds of miles away from where his/her children are if s/he wants to maintain a relationship with them. Too many kids in this world are messed up because their parents are more worried about making the adults happy than doing what is right for the kids.